Available at all healthnglow outlets and in Lifestyle outlets. Also you can buy online shopping Websites like Medplusbeauty, flipkart, slassy, purple etc. Loreal True Match BB Cream comes in a stylish glossy half white tube package with screw open lid. It is pretty easy to carry with us in our pouch or handbag. The Texture of the BB cream is bit thick and creamy. The smell is slightly chemical, but will vanish after applying on the face. This shade is Golden one which is suitable for medium to fair skin tone girls, it looks like yellow in colour. But when you blend it on the skin it gives slight white look. 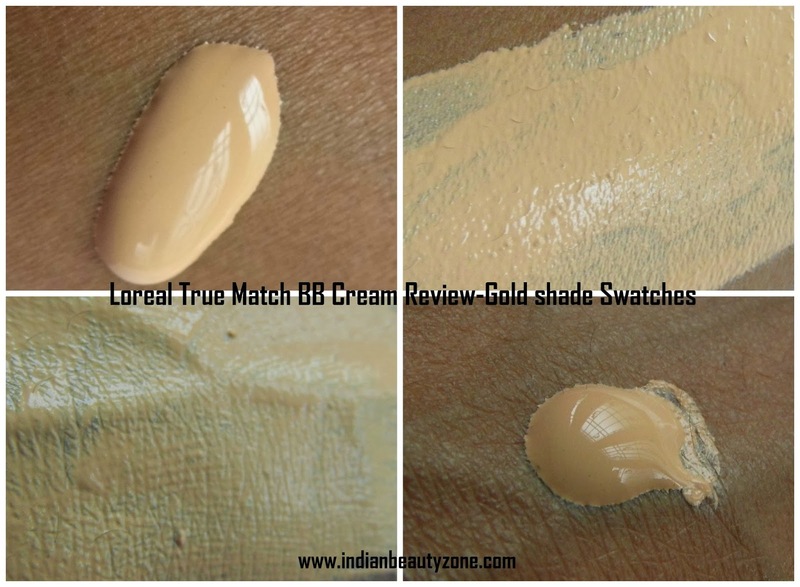 Loreal True Match BB Cream Golden shade is yellow in colour and the texture is bit thick like a foundation. I thought it will be difficult to blend. But, this Loreal BB cream blends on my skin very easily. I have to use very less in quantity to apply, otherwise this gives whitish look. If I use it less in quantity and after blending, the whitish look settles within 10 minutes. It gives a natural look after that with semi matte finish. The coverage is light to medium. You need to use a separate concealer for hiding your major flaws. This BB cream gives a nice glow, but after 3 hours it looks very shiny on my oily skin, so I need to do powder touch ups. This Loreal True Match BB Cream even out the skin very well and stays upto 4 to 5 hours on my oily skin without fading in this winter. I am sure in summer the staying power will be less due to the humid condition here. Overall this is a best BB cream for normal, dry skin beauties for all season. Oily and combination skin girls may need touch ups after few hours, but this one is best wearable BB cream for winter season as it is moisturizing the skin very well. All you need to apply very less in quantity on your face, otherwise you may looks like a white panda. Moisture the skin very well. Even out the skin very well. Best suitable for dry to normal skin. Small quantity is enough for each application. Gives glow to the skin. Gives whitish look if over applied. May not be suitable for oily skin during summer. Loreal True Match BB Cream is the best BB cream for normal to dry skin people, also combination and oily skin people can use it during winter as it moisture the skin well. Can this be used for teen girls? If yes which shade?